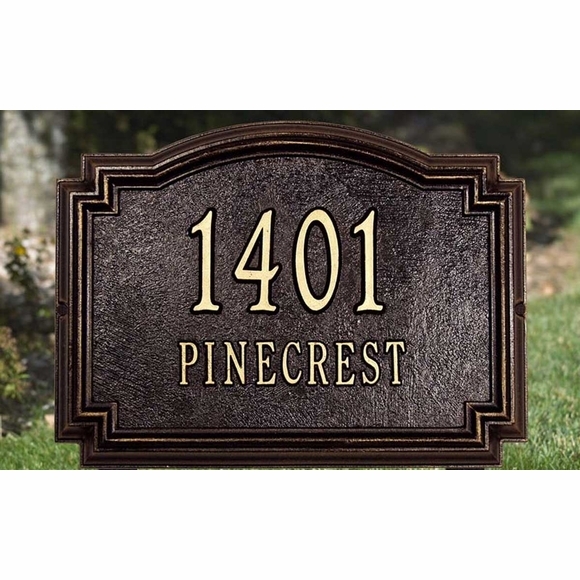 Williamsburg Personalized Home Address Sign - - Standard size address plaque measures 14" x 10.25" and displays both your house number and street name. Includes two lines of personalization. Line 2 holds up to fourteen 1.25" letters (including spaces). Choose wall mount style or lawn style. Lawn markers come with two lawn stakes. Please type the personalization exactly as desired in the input boxes above. and (shown in small images from left to right): AC antique copper; BG black plaque with gold characters; BS black plaque with silver characters; OB oil-rubbed bronze; and PS pewter plaque with silver characters. NEW! Preview it with your address in our Address Plaque Lab: Wall Mount. Lawn Mount.